Media Credit: Hatchet File photo by Keren Carrion. Science, technology, engineering and math faculty are encouraging female students to pursue science-focused careers after graduation. Updated: Feb. 27, 2017 at 9:50 a.m.
GW is working to close the gender gap in science, technology, engineering and math by encouraging female students to pursue graduate education and careers in those fields. Researchers at Cornell University and the University of California Santa Barbara released a report this month finding that men are overrepresented by at least 6 percent in prestigious Ph.D. programs and up to 50 percent in STEM fields. At GW, women makeup about half of the graduate students in biology and chemistry, roughly 28 percent in engineering and about 20 percent in physics. In 2014, about 57 percent of graduate students in biology were female, roughly 40 percent were in chemistry, about 27 percent in computer science and about 20 percent in physics, according to data from the National Science Foundation. Faculty said they are addressing the gender gap in graduate programs by highlighting career opportunities in STEM, prioritizing high-performing female applicants and encouraging undergraduate students to pursue graduate degrees. Michael King, the chair of the chemistry department, said the department has 21 women and 25 men enrolled in its doctoral and master’s degree programs. 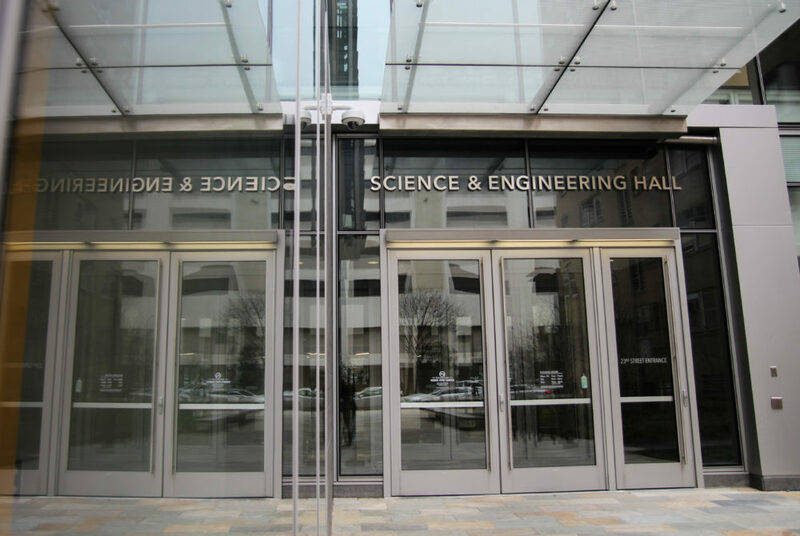 J. Houston Miller, a professor of chemistry, said GW has made progress in diversifying STEM programs and said that a majority of chemistry majors and half of the doctoral candidates in the past five years have been female. “The last three Ph.D.s from my laboratory have been women and 100 percent of the current doctoral students who I have the privilege to work with are women,” Miller said. This is especially relevant because chemistry involves high mathematical proficiency – an area that the study cited as having a major gender disparity – he said. He added that the program’s location in D.C. is attractive because of job opportunities at federal and national agencies. Rachelle Heller, a professor of computer science and the former director of Women’s Leadership Program, said six of 15 computer science professors at GW are female and that the proportion of female computer science students to males is also about one to three. Heller, who recently coauthored a book on how women can pursue careers in STEM, said that women face challenges in the workforce, like unconscious gender bias and being perceived as having less authority. She said students should be treated equally in the computer science program regardless of gender. Heller said that although fewer women across the nation are pursuing STEM careers, GW’s efforts to hire top female faculty to improve female enrollment may give it an advantage over other institutions. She said her department is working on a small project to encourage female students to continue their studies by connecting them to successful computer science alumnae. She added that universities and research institutions should actively recruit minority groups and involve them in discussions. Bill Briscoe, the chair of the physics department, said the number of women in STEM has increased in the past 50 years, but that progress has been slow. Briscoe said that in the 1960s, physics departments were 97 percent male and 3 percent female across the nation. Since then, women have made progress in closing the gap and currently the national average in physics is 90 percent male and 10 percent female, with higher representation of women in astronomy, a subset of physics, at about 30 percent, he said. Briscoe said that to attract high-performing female graduate students, the physics department must offer top candidates spots early. He said universities with larger endowments are able to absorb the costs of over-enrolling programs to attract quality female students and that the University had recently been “very generous” in agreeing to pay for those costs to make offers to female applicants sooner. Briscoe added that the physics department was recently approved as one of 12 sites to host a conference for undergraduate women in physics in January 2018, which he hopes will attract students to the physics graduate program. The Hatchet incorrectly reported that Shelly Heller is an associate dean in the School of Engineering and Applied Science. She is a computer science professor. We regret this error.